2014: A Great Year for Anaerobic Digestion and Biogas in the U.S.
2014 will probably be seen in years to come as a turning point in the development of the anaerobic digestion and biogas energy industry in the U.S.: The year when their industry came of age and finally began to take-off in terms of business. Last year the USDA, with the EPA and DOE at their side, published a Biogas Opportunities Roadmap report. It described the steps that these three Federal Agencies will take to increase the uptake of the anaerobic digestion with the development of many more biogas plants in the United States, on a scale hardly even imagined previously. became accepted in the mind of US businesses? Their "Roadmap" outlines the ways in which those that want to promote waste fed anaerobic digestion projects will be able to overcome the current regulatory restrictions which have been holding back the development of a healthy (energy from waste) biogas industry in the U.S. There is no doubt that this will end up creating new jobs, and injecting cash into the nations economy. At the same time these agencies recognise, that an important part of the Roadmap is in its aims to educate the public on the benefits which will flow from biogas development. Within these benefits is of course the ability of these biogas plants to reduce Greenhouse Gas emissions, and in this and in other ways lead to improvement in the nation's environmental quality. Within the Roadmap there are more than 10,000 farms where it is estimated one of these new alternative energy producing waste processing plants should be built in just a few short years, so the young biogas industry will have plenty to be doing. This news has been welcomed by the American Biogas Association, which is the main industry trade body. For years, third world ranchers have been using methane from manure to run electrical generators down on the farm. This low pollutant emitting biogas is not only a good local fuel in countries with little or no infrastructure, now even countries like the U.S. will be reaping energy from what is otherwise a very smelly resource. About 80 percent of the estimated only 160 biogas energy projects in the U.S. are currently installed on dairy farms, which then combust the gas to generate electricity. The combined installed capacity of all dairy farm projects is now nearly 60 MW, and should now rise rapidly. Until now the value of biogas was not properly understood. Because of that there has been an absence of training and regulation standards. Biogas industry data is under-developed and it has been difficult to secure finance, but in 2015 that should all start to change. In huge tanks, bacteria will turn waste into methane gas, which is burned in turbines or engines that generate electric power. Each large biogas plant can generate as much as a wind turbine, but this energy is far more valauble as it is generated continuously and is not weather dependent. After methanization, the "digestate" produced is further composted and turned into fertilizer that is used by farms in the region. Looking back at the last 12 months we wanted to share another biogas development which was one of our favorite moments. In a recent issue of Biomass Magazine, it was explained that there has been staggering growth in the use of cellulosis renewable information number (RIN) market. To you and me this means that existing alternative energy plants are making much more of it, from compressed natural gas (CNG) to liquified natural gas (LNG). In fact, this renewable energy output surged from 3.5 million in August 2014 to 7.5 million in September 2014, presumably due to new plants coming on-stream. Also, in 2014, municipalities and others who have long been looking for ways to make the best possible use of landfill gas (LFG) created by anaerobic processes at their landfills, will have been further encouraged to go ahead with landfill gas collection schemes. In 2015 and beyond, many more of these should now be equipped with biogas upgrading equipment, and be used to fuel waste collection fleets, or simply sell the compressed biomethane as CNG. Another feature in 2014, has been the number of bodies such as universities and computer data-centre operators that have "gone green", and are generating their own electricity from organic waste. Many have installed their own biogas plants, and a number of those are using fuel cells. These fuel cells convert biogas to electricity through an electrochemical process that also reduces nitrogen oxide, sulfur dioxide and particulate matter emissions, usually by more than 70%. The California Energy Commission was also in the news and is promoting the production of biomethane through regulatory measures. So, California is also keen to see increased uptake of biogas and is seeking ways to capitalize on the emerging high energy feedstocks available in the state. These include wastewater, municipal solid waste and industrial food waste. 2014 has seen them exploring how to encourage utility businesses to install biogas plants, and get the potential consumers of this new alternative energy to use it. This has produced much needed publicity on the market prospects for biomethane, not least in the natural gas powered vehicle market. 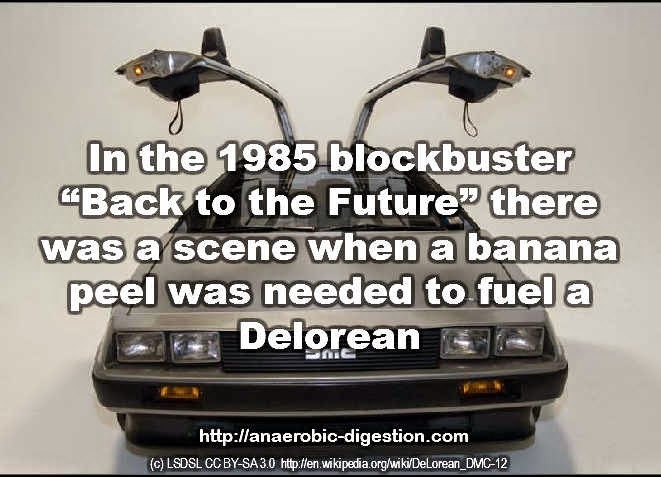 In the 1985 blockbuster “Back to the Future” there was a scene when a banana peel was needed to fuel a Delorean. Not much happened to bring such a prediction into reality in the US until around 2012 when several major project developments were successfully brought on-stream, across the United States. The first food waste digesters were also coming online at that time, and since then they have shown their worth. Move on to 2014, and finally all the "technology talk" of previous years seems to be being brought forward to real action on the ground. Throughout 2014, federal, state, and local market involvements have been propelling developments forward in anaerobic digestion and biogas plant implementation. We hope you enjoyed this article, and wish all our readers a very HAPPY NEW YEAR! Don't forget that we do have a comments section below this blog! Did we get our opinion of US events in 2014 right? Your feedback is important to us. The operating capacity of biogas plants in the UK is rising faster all the time. The technology has recently also been extended from the original use on farms with energy crops, into new areas. Two of these rapidly expanding Anaerobic Digestion (AD) Plant sectors, in the UK, are in sewage sludge treatment, and food waste disposal. In our opinion this goes further because of the use of biogas digesters for the treatment of sewage sludge with the ability to pay for the AD Plant, at least in part, from the sale of the biogas or electricity generated from it. This is now becoming the accepted practise in the UK, and we are certain that the same applies in a number of other nations. However, using biogas digesters for organic wastes from sources such as food waste has much less of a proven performance history. In fact, only in 2011, there were concerns that completely food waste fed anaerobic digestion plants might not be feasible in the long term due to process instability problems. This anticipated obstacle has been eliminated by the results of published studies carried out by the University of Southampton, however, this example just goes to show how very recently the scientific community was still talking about whether this kind of biogas digester would work dependably, or go sour! Fast foward to today, we still are no more than 2 to 3 years after that event, and many large food waste biogas plants have actually now already been commissioned! In addition it is likely that in less than 5 years there will be legislation in the UK which will legally require that food waste be separately collected by all councils, and anaerobically digested. The end-result of this rapid take-up of a new technological application, has in-truth been that there has actually been hardly any time for much study work to be done on digestate disposal and/ or sales/ product improvements, when compared to other aspects of biogas manufacturing. It is an inescapable fact that 90 to 95 % of the original feed product which goes into a biogas digester re-appears as digestate from the digester as digestate, and if the digester is running properly the mass decrease is merely the mass of the biogas created. the techniques by which any AD Plant handles digestate is therefore of big relevance to plant operation and to the financial practicality of each plant. 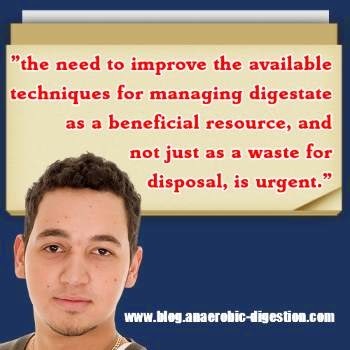 With the undeniable increased popularity of waste digestion, the need to enhance the available strategies for managing digestate, as a helpful resource, and not just as a waste for disposal, is pressing. The next breakthrough the Anaerobic Digestion industry badly now needs is certainly in improving the optimization of digestate by inventing better techniques, and treatment, with the aim being to open-up this product to new, much bigger, and more rewarding markets. Barriers encountered in the UK to finding better ways to enhance and treat digestate were identified in a recent study for WRAP. Read more abut those barriers to digestate enhancement here.